As civil engineering contractors, Mainland Civil provides the plant, manpower and technical services to complete all aspects of your civil engineering, land subdivision and remediation requirements. We recognise that innovation in management style and on-site methodology are key factors for success within a highly competitive industry. Mainland Civil have an enviable reputation for completing projects within programme and budget without compromise to quality and safety. 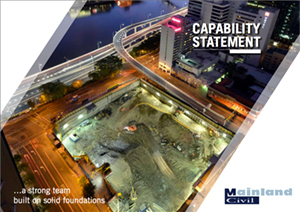 Mainland Civil has developed a reputation as a specialist in the delivery of inner city developments entailing complex earthworks and shoring requirements. We have a proven history of completing some of the most complex and iconic civil projects in Sydney, Brisbane and the Gold Coast. We are currently expanding this part of our business to Victoria to meet demand from key business partners, including Australian and international “Tier 1” builders and contractors. Mainland Civil has many years’ experience on various types of road construction projects, ranging from local road networks in residential subdivisions to heavy-duty pavements in both flexible and non-flexible materials. Our projects have included working within industrial developments, container terminals, ports and airports. In addition, we have frequently provided alternative designs to clients, resulting in significant savings for the project and client. Mainland Civil is also prequalified with various government departments including main roads authorities across Australia. Mainland Civil has a significant level of expertise in this sector of industry, including the rehabilitation of heavily degraded and contaminated land sites, disused tip sites, polluted industrial sites, waterways and wetlands reconstruction, and site regeneration. This work has been recognised with the company winning environmental sustainability and construction excellence awards at both state and national levels. Mainland Civil has completed numerous residential, industrial and commercial projects, including bulk and detailed excavation works, installation of water, sewer, drainage, electrical and communications services and infrastructure, road construction along with public amenities such as parks, lakes, playing fields and cycle ways. Mainland Civil’s delivery of major rail, ports and marine projects includes shipping berths and freight terminals incorporating rail construction, as well as extensive heavy duty pavements for road freight operations. Many of these projects have been completed in high-security working environments without incident and to the highest safety and quality standards. Mainland Civil has completed projects within mine sites, mills, steel works, fuel storage facilities, water recycling plants and on pipeline projects. These works have included bulk excavation and materials processing, construction of haul roads and road networks, construction and repair of pavements, construction of hard stand and industrial sites within mine sites, concrete works and installation of detailed infrastructure. The company has a proven record of excellence and expertise in working in these types of projects and sites, enhanced by our significant capability in system management and EHS compliance to meet mining and resources site requirements.